Can String Theory Survive Complete Falsification? Does History Repeat Itself in a Non-Cyclic Universe? Every epoch has its great scientific questions. It is our hubris at the moment to dream that we can figure out the final theory of the fundamental interactions of physics. This dream goes back to Einstein and his search for the Unified Field Theory, for which he devoted the latter part of his life. However, in retrospect it seems clear that Einstein lived too early for this task. At that time we as a field did not yet even know how to describe the known interactions, or how to use quantum field theory properly. Einstein did not have the right knowledge base and tools to complete his task. These would only come later. Presently we are clearly in a better position because we have a rich and successful description of the world encoded in the Standard Model. We have learned much about Nature and are ready to renew Einstein’s dream for a final theory. Is it our time? 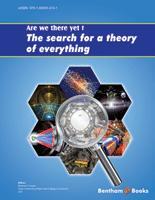 This book is a collection of reflections by young scientists on the goal of a final theory. The science is discussed without its mathematical underpinnings, so that the essays are suitable for a general reader. They are similar to polished versions of the discussions that one hears around the lunch table, debating the dreams and prospects of the unexplored pathways ahead. The issues are subtle and interesting. The descriptions of the known interactions themselves give us a strong clue towards unification. They point to a narrow range of energies in which the unification would occur. This is most obvious for the theory of gravity, which is why so much attention is paid to that interaction. Contrary to old-fashioned wisdom, gravity and quantum mechanics are not incompatible, as has been said for many years. Recent understanding in quantum field theory, in particular the development of effective field theory, shows that gravity and quantum mechanics work perfectly naturally together at low energies. Quantum calculations can be made that predict very tiny modifications of the classical predictions of general relativity. However, these corrections grow with the energy, become overwhelmingly large at an energy referred to as the Planck energy (or Planck mass or simply Planck scale). The well-behaved theory appears to be falling apart above this energy. Something is clearly happening at that scale – probably a new description is needed there. Moreover, the other interactions also point to an energy scale close to the Planck energy. The strength of their interactions also depend on energy, and the electromagnetic, weak and strong interaction strengths all become approximately equal just below the Planck scale. Therefore that scale is where we would expect unification to occur. So we think we have a clue as to where the action is. However, that unification scale is not readily accessible. The Planck energy is about 1016 times higher than the energy of the Large Hadron Collider (LHC), the most energetic device in science. We will never be able to run new experiments at the energy of unification. This is the great hurdle to our present dream. So maybe our problem is different from Einstein’s. Even if you grant that we may possibly have the theoretical tools to describe unification, will we have the experimental ability to learn about Nature at the unification scale? It is actually not hopeless despite the large gap in energy. The early universe may reveal effects from the unification era. Studies of very rare processes, such as the possible decay of protons, may be sensitive to effects from very high energies. However, it has to be admitted that we too may fail at our dream if we are not clever enough to figure out how to validate our theories of unification. This disparity between the available theoretical tools and the intrinsic obstacles to experimental verification underscores some aspects of the sociology of the field at the moment. There is a sometimes bitter debate over the directions of the field and this debate is played out in the public literature and blogs. It is more gently visible within the essays of this book also. That the debate can become so heated is at least partially because experiment is not riding to the rescue. In situations where experiment will quickly decide which of competing theories is correct, people do not need to be overly attached to their theory – it could well be proven wrong next week. But when one does not know if one’s theoretical work will be tested within one’s career, the need to feel correct in one’s research direction (and thereby feeling that others are incorrect in theirs) becomes higher (This comment is not my own – I heard it ascribed to James “BJ” Bjorken. I repeat it because I feel that it explains some of the nature of the public debate). However, it should be said that the fact that the theories are so hard to test is not the fault of the theorists themselves. Many try mightily to think of feasible ways of testing their ideas. The difficulty is just the intrinsic nature of unification theories, required by the remoteness of the unification scale. One variant of the dream would actually be readily verified. This would be if the unified theory predicted all the parameters of the physical world without any adjustable assumptions. There are about 28 numbers describing the Standard Model plus gravity – these give the masses of the particles, the strength of the interaction and various properties in the decay of unstable particles. They appear in the theory without any obvious order – for example the mass of the top quark is about 45,000 times the mass of the up quark, with others falling seemingly randomly (technically, random on a logarithmic scale) in between. No one has made much sense of the pattern of these parameters. They are not predicted by the Standard Model itself – presumably they are the input from some more fundamental theory. Indeed, they appear to be non-trivially odd, in that small variations in the parameters would lead to worlds without atoms or nuclei or without stars. The fact that the parameters have only a small anthropic range – i.e. those compatible with life as we know it – is an interesting topic in its own right and has a modest scientific literature. In any case, we have all these numbers which we don’t understand but which appear to be just so for the existence of key features of our universe. It would be lovely to explain them. The longtime dream of String Theory, which has essentially no free parameters, was that once we could solve the theory we would predict exactly all of these parameters. If that were to work it would be outstandingly impressive and would readily be taken as a verification of the theory. This particular dream has faltered from the indications that String Theory may have so many solutions (the so-called landscape) that any combination of parameters should be possible, and indeed there would be many other realizations besides the Standard Model. At one level, this is deeply discouraging – there goes our big test. However, if that is the nature of the theory, we may have to live with it. This changes the way that we approach the theory of the early universe. Are there domains in the universe that have different values of these parameters, and if so does this explain the special values that we see in our world of atoms and stars? It also changes the way we look for tests of the theory. Does string theory predict that the all the masses should be random on a logarithmic scale or not? Maybe some of the other theories will come to the rescue here and uniquely explain all the features that we observe in the Standard Model. It is of course possible that none of the possibilities under consideration are viable. We could be in the same situation as Einstein was, lacking the knowledge and tools to even head in the right direction. Most directions at present are based on the idea of unification of symmetries. Our present theories have certain symmetries, and the postulate is that the fundamental theory would have more symmetry at high energy. But perhaps the reverse is true – maybe the symmetries that we see are artifacts at low energy, emergent from a fundamental theory without them. This would upset almost all work being done presently. It is important to keep an open mind to all possibilities. We could have some hints in the next few years, coming from the working of the LHC. Although the LHC is unable to directly probe unification at the Planck scale, it may give us hints as to the correct direction. For example Supersymmetry is a key ingredient to String Theory – if evidence for this is found at the LHC it would be an enormous boost for the direction of String Theory even though it does not directly confirm the theory. If it is not found, it is not fatal for the theory but certainly would be discouraging. Moreover, all past colliders that opened up new territory have also found unexpected developments. If that happens, we could get enormously valuable clues. The most optimistic outcome would be if we could find evidence that the unification scale is lower in energy than the Planck scale. So we have the pleasure of looking forward to exciting developments in the next few years. Voltaire’s philosophical satire “Candide, or Optimism” tells the story of the eternally optimistic but misguided professor of “metaphysico-theologo-cosmolonigology”, Pangloss, who argues that we live in the best of all possible worlds, a belief based on Leibniz’ theoretical arguments. With Candide, Pangloss makes an excursion beyond his castle, finding evidence otherwise in some of the atrocities encountered. The book ends with the enigmatic words “We must cultivate our garden” (thereby spawning thousands of college essays to explicate their meaning). I have always had a fondness for this fable, especially when discussing anthropic issues. However, in the context of the present volume, the phrase “cultivate our garden” has a special meaning. We really don’t know which of our present directions will be fruitful. In research, many seeds are planted but only a few really blossom. Each of us tries to cultivate our own corner of the garden in order to see what grows. The young scientists whose essays you are about to read provide us with a tour of their gardens, revealing their thoughts about the prospects and pitfalls for the future. When I was asked by Bentham Science Publishers to propose an idea for an e-book on current issues in physics I thought it was a no-brainer. For several decades the ambition of unifying all of physics under one fundamental set of rules that “fit on one side of a T-shirt” (as some physicists are fond of saying) has been an increasingly nagging objective of basic research. Many ideas were proposed, and this book explores some of the most recent of them, but there has never been a more exciting time in the history of this search: Our most complex experimental tool yet; the $10 billion “Large Hadron Collider”, in Geneva Switzerland, has been turned on and has already had some results published. Who knows what wonderful things it will produce over the next few years and in what directions of research will it guide us. It is then the perfect time to slow down, take a deep breath, and ask ourselves “Are we there yet?” This is what this book is about. The Foreword was written by John Donoghue; professor of theoretical physics at the University of Massachusetts at Amherst. His expertise ranges over several branches of physics at once, having published papers in six research fields: theoretical high energy physics, phenomenology of high energy physics, general relativity, quantum gravity, astrophysics and nuclear physics. He is currently developing ideas in the field of emergent physics. Professor Donoghue is co-author to a classic textbook on quantum field theory “Dynamics of the Standard Model”, published by Cambridge Monographs on Particle Physics, Nuclear Physics and Cosmology” (1992) and editor of “CP Violation and the Limits of the Standard Model (TASI 1994)” published by “World Scientific” (1995). (http://blogs.umass.edu/donoghue/). “The Fire in the Equations”. Tasneem Zehra Husain is a string theorist; currently assistant professor at the LUMS School of Science & Engineering, Sector U, D.H.A, Lahore, Pakistan. She received her PhD from Stockholm University, followed by a postdoctoral research position for two years at Harvard University. Prior to that she had acquired a scholarship at the International Center for Theoretical Physics (ICTP) in Trieste, Italy. Her research interests have so far focused on eleven dimensional supergravity theory. Dr. Husain is the first Pakistani woman to ever achieve such high accomplishments in science. “String Theory and the Failure of Unification”. Peter Woit is a mathematical physicist, currently Senior Lecturer in the mathematics department at Columbia University. After a doctoral degree in particle theory from Princeton, he was a postdoctoral researcher at the YITP in Stony Brook and MSRI in Berkeley before arriving at Columbia. His book “Not Even Wrong” was published in 2006, and he has been maintaining a blog by the same name since 2004 at (http://www.math.columbia.edu/~woit/blog). “Can String Theory Survive Complete Falsification?” Moataz H. Emam is assistant professor of physics at the State University of New York College at Cortland, where he focuses his research on particular aspects of symmetries that arise in certain string-theoretic models as well as developing various teaching curricula with particular focus on involving undergraduate students in theoretical physics research. His future writing plans involve a technical text on certain aspects of the string theory landscape as well as an undergraduate textbook on spacetime physics in both special and general relativity. “String Theory in the Classroom. A Case Study”. D. Cho is currently assistant professor of physics at Kenyon College. His area of specialty is gravitational physics. He has worked on a range of problems from gravitational radiation reaction to quantum gravity in higher dimensions. His recent research is focused on gravitational radiation reaction problems associated with rapidly rotating neutron stars, and quantum field theory in the early universe. “Science Fiction of Everything”. Florian Conrady is currently a postdoctoral researcher at the Perimeter Institute for Theoretical Physics in Waterloo, Canada. He previously held a postdoctoral position at Penn State University and he received his doctorate from Humboldt University in Berlin. The main topics of his research are quantum theories of gravity and topology; in particular loop quantum gravity and spin foam models. “A Vision of Quantum Gravity”. Tim Koslowski is currently a postdoctoral researcher with the quantum gravity group at the Perimeter Institute. He is working on various approaches to quantum gravity, in particular loop quantum gravity and the asymptotic safety scenario. He studied physics at The University of Texas at Austin and the University of Würzburg. “Does History Repeat Itself in a Non-Cyclic Universe?” Sundance Bilson-Thompson obtained his PhD in lattice quantum chromodynamics (QCD) from the University of Adelaide, followed by a year of postdoctoral work in Seoul, South Korea. Dr. Bilson-Thompson proposed a model of the substructure of quarks and leptons which turned out to have possible relevance to quantum gravity. This earned him a three year postdoctoral research position at the Perimeter Institute. In late 2009 he was awarded a postdoctoral research position at the University of Adelaide. “Shooting in the Dark”. Sabine Hossenfelder is assistant professor of physics at the Nordic Institute for Theoretical Physics (NORDITA) in Stockholm, Sweden. She focuses on research in physics beyond the standard model and the phenomenology of quantum gravity. Together with her husband, Dr. Hossenfelder maintains a physics blog called “Backreaction” at (http://backreaction.blogspot.com/). “Deciphering Quantum Theory”. P. Goyal is a theoretical physicist specializing in information physics and the foundations of quantum theory. His recent research focus has been on creating an information-theoretic underpinning for quantum theory. Currently a postdoctoral fellow at the Perimeter Institute, he was previously at the Cavendish Laboratory at the University of Cambridge, where he did his doctoral research and was subsequently a departmental research fellow. In September 2010, he will start a new position as assistant professor in information physics at the State University of New York at Albany. I would like to thank all of the authors for pouring their minds and souls into these articles; sharing with the reader their views on this most exciting of times. Particular thanks and gratitude are due to Professor John Donoghue for writing the foreword. Such a contribution from a scientist of his caliber is an honor and a privilege. Many thanks are due to Dr. Tasneem Husain for agreeing to act as editor to my own contribution and providing valuable feedback. I am also very indebted to my friend Dr. Mohamed Anber for going through the manuscript in detail and proposing essential corrections. Last, but by no means least, I would like to take the liberty in representing all authors in deep thanks to all of our unsung heroes, those who are always the backbone of any effort: family members, spouses, children, mentors, friends and all significant others.